The often-misunderstood scorpion is an incredible creature of ancient origins. The scorpion is a relatively understudied creature, yet their importance is significant. Scorpions play a vital role in arid ecosystems and are of significant medical importance to humans. The study of their physiology is interesting in that little energy is wasted when eating, an important adaptation for life in an arid environment. This adaptation is key to their survival in some of the world’s harshest conditions, and yet this, and so much more, is still not fully understood about one of Earth’s oldest, most fascinating and misunderstood organisms. Scorpions are truly remarkable creatures, and much surrounding their shrouded, but extraordinary lives is still begging to be discovered. Above: A Hadogenes species. This specimen was collected from Gobabeb in the central Namib. Already deceased when discovered, it was drying out in the harsh desert sun. The family history of modern scorpions is in itself, fascinating. A far cry from their current abundance in arid environments, scorpions’ predecessors had a watery existence. Scorpions are ancient creatures that evolved from eurypterids (commonly called sea scorpions), an extinct group of arthropods that were related to arachnids. Eurypterids grew anywhere from 20cm to 2.5m in length. These sinister-sounding creatures were marine arthropods that roamed Earth’s oceans and waters between the Middle Ordovician and Late Permian geologic periods: 470-252 Ma. When examining the now extinct eurypterids’ body structure, a clear resemblance to the modern scorpion exoskeleton is visible. The elongated tail of eurypterids bears a resemblance to that of horseshoe crabs, Limulus polyphemus - marine arthropods that primarily live in and around shallow ocean waters. The Horseshoe crab has occupied Earth’s waters since the Ordovician, the geological period in which the earliest eurypterid fossils have been discovered. One of the oldest living organisms still alive on Earth today and a true living fossil, horseshoe crabs have been swimming around our planet for about 450 million years, 200 million years before the dinosaurs even began to emerge. Horseshoe crabs have stood the test of time, surviving through many geological changes. Only now are numbers starting to dwindle due to overharvesting and coastal habitat destruction. Eurypterids have traditionally been regarded as close relatives of horseshoe crabs, together forming a group called Merostomata, although subsequent studies have since placed eurypterids closer to the arachnids in a group called Metastomata. There has also been a prevailing idea that eurypterids are closely related to scorpions, which they resemble. Above: A solifugae found in northern Namibia. Solifugae, like the scorpion, are arachnids that have similarities to scorpions, spiders and other arthropods. The evolution of ancient marine arthropods into the terrestrial scorpions that we see today is evidence that scorpions are descendants of extremely adaptable creatures capable of not only surviving, but thriving in their multitudes through many of the Earth’s geological periods. The scorpions’ adaptability through hundreds of millions of years of climatic and environmental change is not to be understated; over those countless years, conditions have swung from that of high humidity to relentless aridity, even dipping into glacial periods. The adaptability of scorpions, of which there are over 2000 species throughout the world today in every continent, save Antarctica, is a testament to their ancestor’s robustness – surviving and evolving over hundreds of millions of years, through varied and often harsh conditions. Many of today’s terrestrial scorpions can survive extreme temperatures, from below freezing to above 50°C. One environment in which scorpions can be subjected to such dramatic temperature variability is in the Namib Desert. The Namib is an ancient, coastal fog desert located on the western coast of Namibia where seasonal and night-time/daytime temperature variability can be extreme. The origin of the name Namib comes from the native Nama language, and means “vast place”. The Namib Desert proves itself worthy of its name with its endless gravel plains and flowing Sand Sea, stretching across such a “vast place”. The Namib Desert is home to a rich diversity of life including nine scorpion species. In southern Africa alone, 140 species of scorpions have been identified. Buthidae and Scorpionidae are the two families of scorpions present in the Namib. Although only two families of scorpions have evolved to live in the Namib, they have managed to find an array of suitable habitats. Buthidae contains the highly venomous fat-tailed scorpions and tree bark scorpions, while Scorpionidae contains primarily burrowing scorpions. Certain Buthidae and Scorpionidae are restricted to sand systems such as the Namib, the Kalahari, and the Sandveld, as well as the isolated sand systems of southern Namibia and the Northern Cape Province (South Africa), and the sandy areas of the Limpopo Depression. Scorpions of the Namib Desert have found a variety of suitable habitats for themselves, most often under rocks or in crevices where they shelter during the day to avoid predators and the unmerciful conditions of the desert. Many species of scorpions in the Namib create their own home by digging a burrow in soft sandy soil or fine gravel. The bark of the Camel Thorn tree, Acacia erioloba provides shade and shelter to many Uroplectes, or tree bark, scorpions. Camel Thorn roots are capable of extending 50 metres or more underground to extract the moisture necessary for growth, thus the trees can be found in large quantities along the banks of ephemeral rivers where the roots can reach underground aquifers. With an abundance of Camel Thorn trees along ephemeral rivers in the central Namib, one of the more easily spotted scorpions is the common tree bark scorpion, Uroplectes otjimbinguensis. Numerous tree bark scorpions can be found after sunset. The small, nocturnal creatures can be located in the dark the same way as every other scorpion – by using ultraviolet (UV) light. Chemicals in the exoskeleton cause scorpions to fluoresce when subjected to UV light. Despite several theories, there is no conclusive evidence as to the purpose of their fluorescing. Perhaps it is a way to attract prey – scorpions emerge at night, and UV light reflecting off of the moon as well as the dim light from stars could illuminate scorpions and attract insects to them, much like how insects are attracted to other artificial light sources. Many insects, such as bees, can see a broad spectrum of light including ultraviolet, which is invisible to humans. When viewed with specialist equipment that can see within the UV spectrum, some flowers exhibit intricately designed patterns and exquisite colours, invisible to the naked eye of a human. This is to attract pollinators, and the fluorescing of scorpions could be relatable - a possible way to attract prey. However, studies have shown that many species come out less frequently in bright moonlight, when they are exposed to more UV light than on dark nights, casting doubt on this theory. One scientists' test of this hypothesis suggested that insects may actually avoid fluorescing scorpions. Above: Searching for fluorescing scorpions with UV light in the Kuiseb River - an ephemeral river that meanders through parts of the Namib Desert. Another theory as to why scorpions fluoresce is to avoid predation. A scorpion’s lateral eyes are very light sensitive and can distinguish light from dark effectively. Their eyes have excellent low light sensitivity, able to detect starlight against the background of the night sky; well suited to their typically nocturnal behaviour. This generally makes the scorpion confident in its nocturnal practices. If scorpions can sense the fluorescing of each other, then perhaps it is a useful mechanism to alert the creatures that they are exposed - visible and potentially vulnerable to predation, especially because the diets of many scorpions consist of other scorpions. That said, diurnal (daytime) activity is somewhat common in several species of scorpions throughout the world, (notably the Parabuthus villosus in the Namib) making the need for a nocturnal fluorescing defence appear unnecessary. Other theories suggest that the fluorescing of scorpions when exposed to UV light could be a vestigial trait (a mechanism that has become functionless over the course of evolution) or an aposematic signal (markings or colouration to serve as a warning to predators). The truth remains unknown despite several disparate theories providing tangible evidence. The data gathered from various experiments and observations is still insufficient to definitively illuminate the truth surrounding this topic. Above: A common Tree Bark Scorpion, Uroplectes otjimbinguensis, fluoresces when exposed to ultraviolet light. Scorpions, just like all other animals with an exoskeleton, must undergo ecdysis (the process of shedding skin in order to grow). The new exoskeleton will not fluoresce under UV light until it hardens, which can take 10-20 days on average depending on the species. Experiments have shown that the magnitude (brightness) of the scorpions fluorescing can also be reduced through continuous and prolonged exposure to UV light, indicating that the chemicals in the exoskeleton can decay over time. After ecdysis and the hardening of the new exoskeleton, the chemicals will be 'refreshed' and the scorpions glow will once again reach a brighter appearance. Just how dangerous are scorpions? Scorpions are often misunderstood creatures. The mere mention of their name strikes fear into many, and unsurprisingly so. Scorpions are arachnids, with vicious pincers (pedipalps) and intimidating tails that can inject potentially deadly venom. Despite this, scorpions are not on a mission to inflict pain and suffering upon others – they will actively avoid large mammals and only usually sting humans as a means of defence; even then, the venom of the majority of scorpion species is not potent enough to kill a human. Despite this, several species of scorpion do possess venom potent enough to kill a human. Whilst statistics are scarce or often unreliable, an estimated 3,250 people are thought to die from scorpion stings around the world every year. In southern Africa it is probable that any large Parabuthus species can cause death in humans, especially where there is evidence that the nervous system is already compromised. One should not become complacent when attempting to handle scorpions; respect is due just as with any other creature but to kill or harm a scorpion is completely unnecessary. Ignorance is often due to a lack of understanding. Scorpion stings probably evolved in the first instance as a means of subjugating prey, but they are used secondarily in defence; injecting venom is not energy efficient. Whilst scorpions have evolved to become the top predators of some extremely arid environments, they do not have an easy life. Other animals have also learned to counter-adapt to dangers. Baboons and other monkeys have become adept at catching scorpions without getting stung, by tearing off the tail and devouring just the body. Above: Often pitch-black, Parabuthus villosus is the largest member of the family in the world as well as one of the most venomous in the Namib. The pectines can be seen brushing along the floor – these comb-like structures are used for sensing temperature and humidity levels as well as for feeling the substrate. Parabuthus villosus is one of the few scorpion species in the Namib that has shown diurnal behaviour. It has also been observed drinking moisture collected on grass stems from a desert fog event. Above: The Parabuthus villosus is a very hairy species with a thick tail, the latter of which is a characteristic of the highly venomous species. Above: Parabuthus villosus - Fine hairs acts as sensory devices. Parabuthus granulatus is considered to be the most venomous scorpion in southern Africa. An interesting adaptation of Parabuthus granulatus is its colouration. It can take on a blackish/brown colour in parts of South Africa where the land consists of darker rocks and gravel, whereas in the Kalahari Desert it takes on a dark yellow/orange colouration, presumably to blend in with the Kalahari sands where it can dig shallow burrows. Above: This particular Parabuthus species was found in an ephemeral river in the central Namib Desert. It could likely be Parabuthus raudus, however it can be difficult to determine species when colouration often differs dramatically within the same species. The venom of all known scorpion species in the Namib consists of neurotoxins, which means it affects parts of the nervous system such as breathing, circulation, muscular co-ordination and blood pressure. Uses of venom extend further than just subjugating prey or warding off predators. The venom of some scorpion species can be used for medical purposes such as painkillers, and cure certain conditions such as lupus, rheumatoid arthritis, and prevent cancer cells from passing. Above: Looking in to the chelicerae (mouthpart). Scorpions play a vital role in the various ecosystems of the Namib Desert and the disruption and destruction of their habitats can have a cumulative effect on other life forms. Other than the venom of some Namibian scorpion species having a significant medical purpose, the importance of scorpions extends to being the top predators in some extremely arid areas. Insects are a primary source of food for scorpions, thus they control the abundance of insects. The burrowing species of scorpions replace the function of small mammals in extremely arid environments such as the Namib, by aerating the soil and improving porosity/permeability. Ritha Kapitango, a researcher at Gobabeb Research & Training Centre, where a permanent Namib Desert research station exists, studied various sites within the central Namib to measure the abundance of certain scorpion species. At the Swakop ephemeral river, normally host to a prime scorpion habitat, at least 70 trees per hectare had been cut down and burned. An unusually high quantity of the burrowing Parabuthus spp. was observed as well as a decline in tree bark scorpions, Uroplectes otjimbinguensis, compared to similar sites, hinting that the anthropogenic interference was the cause. Above: Ritha measures air temperature to see if it can be correlated to scorpion activity in an ephemeral river in the Namib Desert. The common tree bark scorpion, Uroplectes otjimbinguensis, is a species of southern African scorpion, which can usually be found after sunset between the peeling bark of Camel Thorn trees – its preferred habitat. Ritha found drastically fewer tree bark scorpions at another ephemeral river she visited and concluded that this was due to the invasive Honey Mesquite tree, Prosopis glandulasa. When studying sites with a higher abundance of their preferred indigenous trees, a higher population of tree bark scorpions was noted – an indication of the importance of managing and reducing such aggressive alien invaders. Above: A tree bark scorpion, Uroplectes otjimbinguensis, can be seen fluorescing when exposed to ultraviolet light. Its preferred habitat is within the peeling bark of the Camel Thorn tree, Acacia erioloba. Despite an abundance of scorpion species across the globe, many are seldom seen by the casual passer-by. This in turn could be attributed to their largely nocturnal behaviour as well as their homes typically being hidden from prying eyes. The homes of burrowing scorpion species in the Namib are often characterised by a seemingly insignificant dome-shaped entrance. However, these small openings often lead to subterranean architectural wonders. 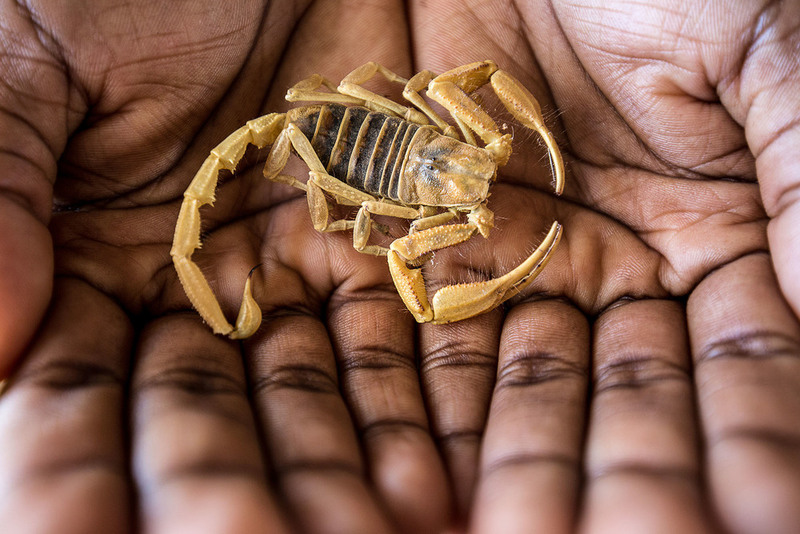 Martin Handjaba, a researcher at Gobabeb, and a team from Ben Gurion University of the Negev, used ordinary resin to cast scorpion burrows in the sandy soils. The cold resin was poured into a burrow opening where it eventually dried and created a positive of the burrow. It is described as a positive due to the resin creating a hollow tube as it seeps into the surrounding soil. However, a consequence of this seepage is an unclear representation of true burrow size and structure. A negative burrow casting, created with aluminium or zinc creates a solid burrow structure, giving a clearer representation of burrow size and structure due to the minimal seepage. As the resin dried out, the team were able to extract the hardened burrows from the ground, which gave an indication of the true extent of these grand structures. Burrow occupants were first collected in pit-falls to avoid unnecessary deaths. Above: A spiralling burrow of a scorpion is unearthed from the sandy soils of the Namib. Above: Researchers at Gobabeb extract an unoccupied scorpion burrow from the sand. The burrow structure had hardened due to the drying of resin. Above: Martin Handjaba prepares to create a negative burrow casting by heating zinc to its melting point of 419.5 °C. Above: Martin prepares to remove the lid to extract the melted zinc. Above: Martin Handjaba and Dr. Eugene Marais pour liquefied zinc into a burrow to create a negative cast. The occupant had been removed prior to casting. 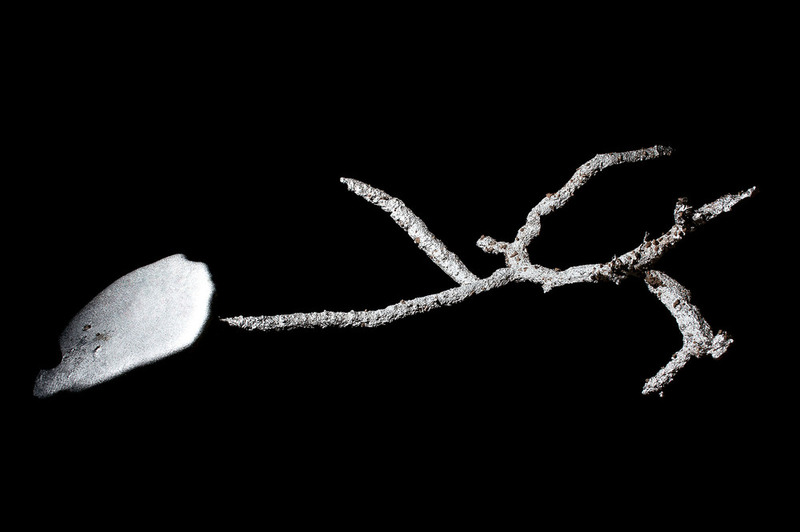 Above: The result of casting a barking gecko, Ptenopus garrulous burrow with zinc. The structure of a burrow differs between animal species. The burrow of this gecko has separate chambers, which branch out as opposed to the usual spiralling shape of a scorpions’. Martin and the team discovered separate chambers throughout the winding and spiralling burrows, consistent with other burrow studies worldwide. Not only is burrowing a successful way in which to avoid predation or fire, but it is also an effective way to minimize the harsh conditions of the desert environment. The deeper the burrow, the cooler and more humid the environment within the burrow is. In the deeper areas of scorpion burrows, carbon dioxide levels are also higher than oxygen, an interesting oddity in which the burrowing scorpion species have adapted to live in. Research has shown that when surface humidity is less than 5 per cent, the humidity of a burrow descending to a depth of 20 to 35cm can be as high as 55 to 70 per cent. When midday soil temperatures in the Namib can reach 70°C, a means of escaping the scorching substrate is necessary for even the most superlatively adapted of creatures, and a well-crafted burrow can provide much needed respite. It is considered probable that the burrowing of scorpions is a niche construction, a process in which an organism modifies its environment in a manner that increases its chances of survival. The importance of burrowing extends further than just acting as a home for some scorpion species. The burrow introduces water and air into the soil and when the scorpion takes prey into the burrow, it can add a significant amount of organic matter to the soil. One could assume the mysteriousness and general lack of understanding surrounding scorpions is largely attributed to their nocturnal and secretive lives - hidden away underground, in-between rocks, crevices or tree bark, scorpions are seldom seen by most. When we do encounter these creatures, being overcome with the fear of being injected with potentially life threatening venom is not unusual. Despite significant research currently being undertaken on scorpions in the Namib, further studies are needed if we are to ever come close to fully understanding these intriguing creatures. Creatures of ancient origins, scorpions were formally bound to the oceans. They have now managed to not only climb out of the water and on to land, but also adapt to some of the hottest and driest places on Earth. Caution should be exercised with the highly venomous species, but to kill or harm unnecessarily is to defile hundreds of millions of years of evolution. Scorpions are superbly adapted predators, which possess otherworldly physiological traits of which we don’t yet fully understand. As well as being of vital importance to arid ecosystems not only in the Namib, but the world over, scorpions can provide us with medically significant venom. These are substantial reasons as to why these understudied, small, but significant creatures deserve attention. The Incredible BioArchitectes of the Namib: http://www.gobabebtrc.org/index.php/component/content/article/1-latest-news/316-the-incredible-bioarchitects-of-the-namib - Martin Handjaba (2016). Garwood, Russell J.; Dunlop, Jason A. (2014). Three-dimensional reconstruction and the phylogeny of extinct chelicerate orders. PeerJ 2: e641. P. Weygoldt; H. F. Paulus (1979). Untersuchungen zur Morphologie, Taxonomie und Phylogenie der Chelicerata. Zeitschrift für zoologische Systematik und Evolutionsforschung 17(2): 85–116, 177–200. J. Versluys; R. Demoll (1920). Die Verwandtschaft der Merostomata mit den Arachnida und den anderen Abteilungen der Arthropoda. Koninklijke Akademie van Wetenschappen Amsterdam 23: 739–765. J.Leeming (2003). Scorpions of southern Africa. New Holland Publishing. 6. L. Prendini (2005). Scorpion diversity and distribution in southern Africa: pattern and process. In African Biodiversity. 1-2. L. Prendini (2005). Scorpion diversity and distribution in southern Africa: pattern and process. In African Biodiversity. 25-68. J.L. Cloudsley-Thompson (1988). Evolution and Adaptation of Terrestrial Arthopods. Springer-Verlag Berlin Heidelberg.124-125. C.T. Kloock (2005). Aerial insects avoid fluorescing scorpions. Euscorpius, 21: 1-7. M. Schliwa; G. Fleissner (1980). The lateral eyes of the scorpion, Androctonus australis Cell and Tissue Research, 206: 95-114. Research Notes. Diurnalism in Parabuthus villosus (Peters) (Scorpiones, Buthidae). The Journal of Arachnology 10: 85. C.T. Kloock (2009). Reducing scorpion fluorescence via prolonged exposure to ultraviolet light. The Journal of Arachnology 37(3): 368-370. J.P. Chippaux; M. Goyffon (2008). Epidemiology of scorpionism: a global appraisal. Acta Trop. 107 (2):71-9. J.L. Cloudsley-Thompson (1988). Evolution and Adaptation of Terrestrial Arthropods. Springer-Verlag Berlin Heidelberg. 124-125. J.Leeming (2003). Scorpions of southern Africa. New Holland Publishing. 27. R.M. Johnson; H.L. Stahnke (1960). Chromatographic comparison of scorpion venoms. Science, 132; 895-896. R-M.K.H.Kapitango (Unpublished). The effects of geo-locations and anthropogenic disturbances on the abundance of tree scorpions (Uroplectes otjimbinguensis) in three ephemeral rivers. 15-20. R-M.K.H.Kapitango (Unpublished). The effects of geo-locations and anthropogenic disturbances on the abundance of tree scorpions (Uroplectes otjimbinguensis) in three ephemeral rivers. 13-22. J.Leeming (2003). Scorpions of southern Africa. New Holland Publishing. 29.